Starting with an idea born in 1996, Mike Boehm has organized an "Art Penpal" program in which children in the Vietnamese hamlet of My Lai are exchanging drawings with children living in Madison. Wanting to broaden our involvement with the people of My Lai beyond economic development projects, Mike Boehm proposed the idea of an art exchange to Mr. Tran Anh Trung, Vice-Chair of Son My (My Lai) Primary School in November, 1996. He also provided art materials for the students. Mike shares his first hand knowledge about the children and their lives in Vietnam. Boehm sees the forging of warm relations between the children of My Lai and Madison as a part of building a better future for the adults of tomorrow. He has spent hours with children in both communities, telling them about one another, and encouraging a communication that has taken the form of exchanging drawings. 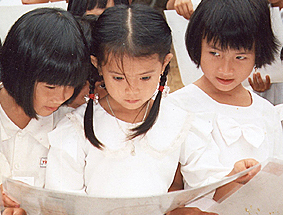 Typical Vietnamese student art includes pictures of farms, fishing boats and village scenes. When Boehm returned to Madison with the drawings from My Lai, the students at Marquette Elementary School responded with curiosity and concern for the children of My Lai. On his return visit to Viet Nam in September, 1997, with more artwork, it was clear that his vision was taking root. 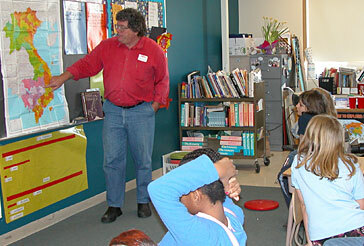 Beginning with the first art exchange at Marquette Elementary School in 1997, other schools from Madison and other cities have created art exchange programs. Another example of a youth project is madison Wisconsin Girl Scout troop Blackhawk Chapter 50 which raised funds through a $500 grant and their girl scout cookie money to fund an outdoor toilet, well and holding tank for a primary school in My Lai. For more information about this effort please read Winds of Peace issue #5, pages 8-10. The possibilities for this art exchange are best expressed by an eight year old participant from Madison, Wisconsin. When asked if she had heard of the Viet Nam War, she said she had "...But that was a long time ago. Now we can be friends." Greeting card sets featuring the drawings of the Vietnamese students are featured on our site. The Vietnamese children have no formal training in art. Children from My Lai draw what their lives include: fishing, life near the river, and the mountains and birds around them. 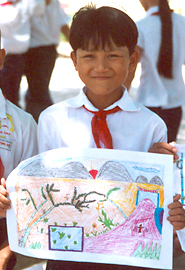 Vietnamese boy shows us drawing made by a student at Marquette Elementary School, Madison, Wisconsin.